As Logistics Coordinator at SSO, Jorge Vazquez supports the Conference Services department. On a daily basis, Jorge collaborates with the Conference Services team to provide the necessary tools and AV equipment, configuring setups and serves as the key resource in SSO’s 12 conference rooms. Jorge specializes in working with the team to ensure that all clients’ required needs are met and that they enjoy a worry-free experience executing their meetings and events. As an audio/visual expert, Jorge is called upon to troubleshoot any technical problems that may arise during meetings, allowing clients to focus more on their meetings and less on the environment and equipment. Jorge has lived in the Northern Virginia area since his early childhood years. 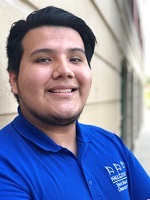 As a recent graduate of Stonewall Jackson High School, Jorge plans to continue his education in the field of architecture. Jorge brings to SSO a great understanding of Customer Service. When Jorge is not in the office, he enjoys spending time with family and friends, taking walks, going to the movies, and playing soccer.